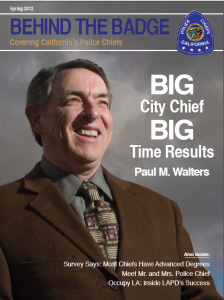 When the Santa Ana City Council stupidly fired former City Manager and Chief of Police Paul Walters, who was the victim of a political witch hunt against Mayor Miguel Pulido, they knew they were in real legal trouble because he had contracts in place. The agreement they worked out with Walters included naming the city’s police building in his honor. The agreement stipulated that within 18 to 24 months the city’s police administration building would be renamed the Paul M. Walters Police Administrative Building and have a plaque in the lobby hailing Walters’ “service to the city,” according to the Voice of OC. Well that day has come! There will be a ceremony at the Santa Ana Police Administration Building on May 29, 2014, at 4 pm, in the community room. Walters saved our city from a budget crisis when he outsourced the Santa Ana Fire Department to the Orange County Fire Authority. He did a fine job as our City Manager and was run out of town by our City Council, for no good reason. Walters also did a great job as our Chief of Police. He remains widely recognized in the police community for his acheivements. We are really feeling his absence – as crime has been steadily growing since he left. As we have reported previously, even the nicer neighborhoods in north Santa Ana have been heavily targeted by burglars in recent months. Walters deserves the accolades he will be receiving on May 29. Putting his name on the building he essentially created, is a great idea – perhaps one of the few good ideas to come out of this City Council.